The Las Bambas group of porphyry/skarn copper-molybdenum-gold deposits, Ferrobamba, Chalcobamba and Sulfobamba, are located some 72 km SW of Cusco and around 530 km SE of Lima in southern Peru. It is approximately 90 km north-west of the Tintaya porphyry/skarn deposits (#Location: 14° 3' 36"S, 72° 20' 44"W). The Las Bambas cluster of deposits lies within the Andahuaylas-Yauri belt, south of the Abancay Deflection in the Bolivian Orocline, the northern segment of the Central Andes. They represent the northern extremity of the 1400 km long belt of major Eocene to Oligocene porphyry deposits, mainly in northern Chile, limited to the north by the Abancay Deflection. They also lie within the transition between the setting of the Central Andes porphyry deposits, characterised by Cenozoic volcanic sequences, to that more typical of the Peruvian Andes, where platformal carbonates are the dominant country rocks and associated skarn alteration is ubiquitous. The Andahuaylas-Yauri belt covers an area of ~25 000 km2 in southern Peru and extends for ~300 km between the localities of Andahuaylas in the NW and Yauri in the SE, ~250 to 300 km inland from the present-day Peru-Chile trench. The region is underlain by 50 to 60 km thick continental crust (James, 1971), and straddles the transition zone between the southern, normal subduction regime of southern Peru and northern Chile, and the current northern flat subduction zone of central and northern Peru (Cahill and Isacks, 1992). Basement in the region comprises Precambrian to mid-Palaeozoic gneisses, ~130 km to the northwest of Cusco (Carlotto, 1998), probable extensions of the Marañón massif to the north, overlain by >10 000 m of Palaeozoic rocks, which include >10 000 m of volcanosedimentary, marine and continental rocks of Cambrian to Early Permian age (Marocco, 1978; Carlotto et al., 1996; Carlotto et al., 1997). The upper section of the pre-Andean basement is dominated by >1000 m of volcanic and clastic rocks of the Permian to Early Triassic Mitu Group in the Mitu extensional graben (Perelló et al., 2003). The Mesozoic stratigraphy of this part of Perú is largely composed of Jurassic and Cretaceous sedimentary sequences deposited in a setting dominated by two main basins, the Arequipa basin and the Eastern Peruvian foreland basins, separated by the Cusco-Puno basement high (Carlotto et al., 1993; Jaillard and Soler, 1996). The Arequipa basin and Cusco-Puno high are respectively the southeastern extensions of the Pucará basin and Marañón Arch of the main Peruvian Andes to the NW of the Abancay Deflection (see the Peruvian Andes record for more detail). The Arequipa basin (to the west; Vicente et al., 1982), corresponds to the present-day Western Cordillera, and contains a Middle Jurassic to Late Cretaceous sedimentary pile that is >4500 m thick, with a lower turbidite dominated section, a middle quartz arenite, and an upper sedimentary sequence with abundant limestone (Vicente et al., 1982; Jaillard and Santander, 1992). The northeastern edge of the Arequipa basin, overlaps the Andahuaylas-Yauri region, and includes the Lagunillas and Yura groups (Marocco, 1978), respectively made up of Early Jurassic limestone and Middle to Late Jurassic to Lower Cretaceous quartz arenite and shale, with a total thickness of approximately 800 m followed by upper Cretaceous carbonate rocks. In the Las Bambas district, the Yura Group is composed of the Upper Jurassic Chuquibambilla Formation quartzites and pelites, followed by 200 to 300 m of sandstones of the Soroya Formation. These rocks are overlain by 50 to 200 m of calcareous clastics lutites and sandstones that comprise the late-Lower Cretaceous Mara Formation. These are overlain, in turn, by the Upper Cretaceous massive micritic limestone, black shale, and nodular chert of the 30 to 500 m thick Ferrobamba Formation (Marocco, 1978; Pecho, 1981). In contrast, the basement of the Cusco-Puno high is overlain by ~900 m of Late Jurassic to Paleocene terrigenous red beds interbedded with shale, limestone and gypsum (Carlotto et al., 1993; Jaillard et al., 1994). The Mesozoic sequence is unconformably overlain by two main units, specifically the Eocene to early Oligocene San Jerónimo Group and the dominantly volcanic Anta Formation. San Jerónimo Group consists of two main units (the Kayra and Soncco formations), with a total thickness of ~4500 m, made up of red bed terrigenous (sandstone, shale, pelitic sandstone, and volcanic microconglomerate) strata, interbedded with tuffaceous horizons near the top. The Soncco Formation includes horizons of stratabound copper mineralisation, up to several metres thick, with hypogene chalcocite and bornite, and supergene copper oxides (Cárdenas et al., 1999). The Anta Formation is a >1000 m sequence with a lower member containing andesite lava flows and dacite pyroclastic flows locally interbedded with alluvial conglomerate, and an upper member of fluvial conglomerate with interbedded andesite and basaltic andesite flows (Perelló et al., 2003). These rocks are succeeded by Oligocene to Miocene sedimentary rocks of the 1500 to 5000 m thick Punacancha and >1100 m thick Paruro formations, dominated by coarsening-upward red shale and sandstone, with gypsum and conglomerate being characteristic in the upper parts of the sequences. Oligocene and Miocene volcanic rocks in the region are largely the calc-alkaline sequences of the Western Cordillera and Altiplano, and include the Oligocene Tacaza (trachyandesite, andesite and rhyolite tuff) and Miocene Sillapaca (mainly dacite flows with subordinate andesite) groups. In addition to these, a series of scattered, small shoshonitic volcanic centres of Pliocene to Quaternary age are mapped (Perelló et al., 2003). • Light to dark grey equigranular granodiorite and granodiorite-hornblende porphyries between 39 and 37 Ma. iii). Subvolcanic rocks and porphyry stocks of granodioritic/dacitic, monzonite, quartz monzonite and quartz diorite porphyry composition, locally associated with the hydrothermal copper mineralising event of the Andahuaylas-Yauri Belt, e.g., the porphyry-style Tintaya, Katanga, Las Bambas and Los Chancas deposits. Most of these centres include directly related mineralised garnet-pyroxene-magnetite skarn bodies developed in the Cretaceous carbonate rocks. 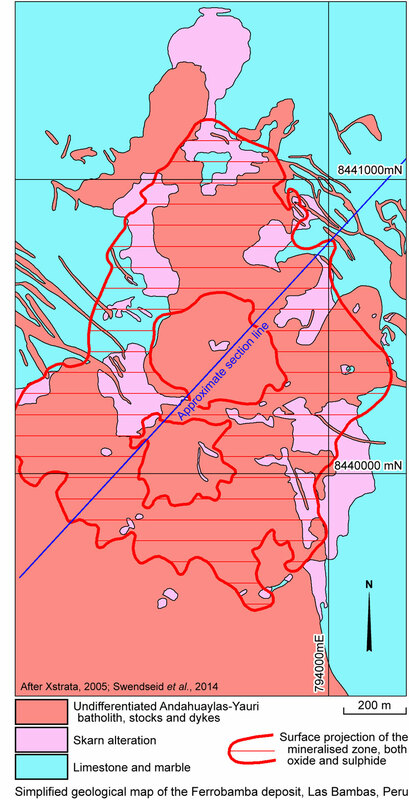 The radiometric ages of the alteration-mineralisation of this event vary from 38 to 32 Ma. These intrusions represent the most evolved and terminal stage of the batholith-wide fractionation trend. iv). Post-mineral dykes and small, barren, quartz-monzonite stocks and dykes with very well developed quartz and orthoclase phenocrysts. These intrusions show no alteration or associated mineralisation. The final phase was the emplacement of dykes and small stocks, principally of dacites and andesites, which in some instances overlap the mineralised zones and substantially affect bulk grades. Other post-batholith intrusive activity includes a series of small ~28 Ma syenitic stocks (Carlotto, 1998), part of a larger alkalic magmatic province that also includes the basanites, phonotephrites and trachytes of the Ayaviri region in the SE of the batholith, with ages between 29 and 26 Ma (Carlier et al., 1996, 2000). The region has been affected by several Late Cretaceous to Pliocene tectonic events (Marocco, 1975; Pecho, 1981; Cabrera et al., 1991; Carlotto et al., 1996) of which the Eocene to early Oligocene (Incaic) and Oligocene to Miocene (Quechua) pulses are the most important. A salient feature of the belt is the spatial distribution of porphyry copper stocks around the edges of the main intrusions that constitute the Andahuaylas-Yauri batholith, as exemplified by the Las Bambas cluster (Perelló et al., 2003). According to Perello et al. (2003), the Andahuaylas-Yauri belt is defined by >30 centres that exhibit porphyry-style alteration and mineralisation, including 19 centres that are grouped in 5 main clusters, plus another 12 separate centres, with hundreds of occurrences of magnetite-rich, skarntype Fe-Cu mineralisation. Porphyry copper stocks are dominated by calc-alkaline, biotite- and amphibole bearing intrusions of granodioritic composition, with local monzogranitic, monzonitic, quartz-monzonitic, and monzodioritic stocks. Within the Las Bambas district, whole-rock major elements versus intrusion age plots for the intrusives of the middle Eocene-early Oligocene Andahuaylas-Yauri Batholith indicate fractionation trends beginning with precursor gabbro to diorite bodies that evolved to early-stage, pre-mineral quartz diorite and monzodiorite intrusions. Intermineral and late intrusions are monzodiorite to quartz monzodiorite and commonly have a porphyritic texture. Mineralizing intrusions plot as the most evolved felsic end member of the batholith-wide fractionation trend (Kelley et al., 2016). The three Las Bambas project deposits, Ferrobamba, Chalcobamba and Sulfobamba are distributed over an approximate east-west interval of 15 km, with Chalcobamba being 7.5 km NW of Ferrobamba, and Sulfobamba, 5.5 km west to WSW of Chalcobamba. Ferrobamba and Chalcobamba are near the eastern and western margins respectively of an ~20 x 5 to 10 km wide, NNE-SSW elongated exposure of the composite Andahuaylas-Yauri batholith. Sulfobamba lies on the eastern margin of the next exposure of the batholith to the west. 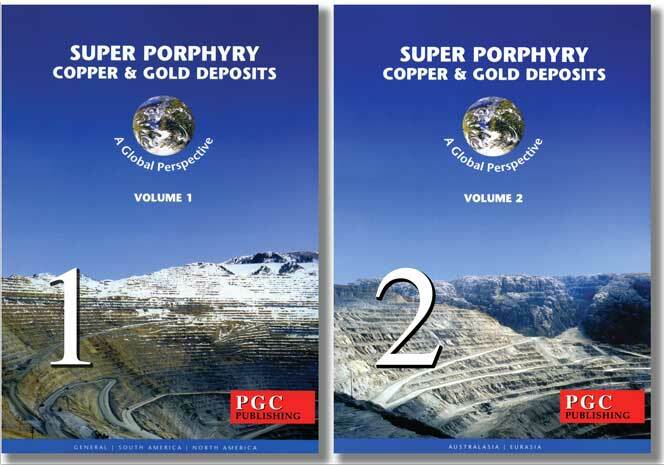 Mineralisation at all three deposits includes components of classic porphyry-style (stockwork veining, sheeted veins and disseminations) and skarn alteration hosted mineralisation. Skarn-hosted mineralisation occurs as disseminated to clotty copper sulphide minerals, with superimposed porphyry-related sheeted veins (Kelley et al., 2016). Gold occurs as a dissolution state predominately within the bornite sulphide crystals. The fourth significant member of the cluster is Haquira, which is located ~7 km south of Chalcobamba. 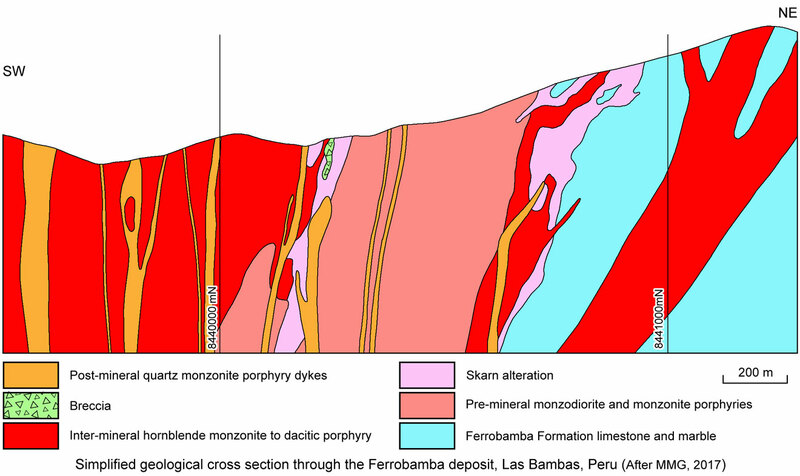 All of the skarns are hosted by the Ferrobamba Limestone unit and are accompanied by porphyry copper style mineralisation associated with monzonite and quartz monzonite phases derived from stepped igneous differentiation between 42 and 40 Ma at Ferrobamba and 38 to 36 Ma at Chalcobamba. The lower Ferrobamba Formation horizons, near their contact with the Mara Formation, are the preferred host rocks. 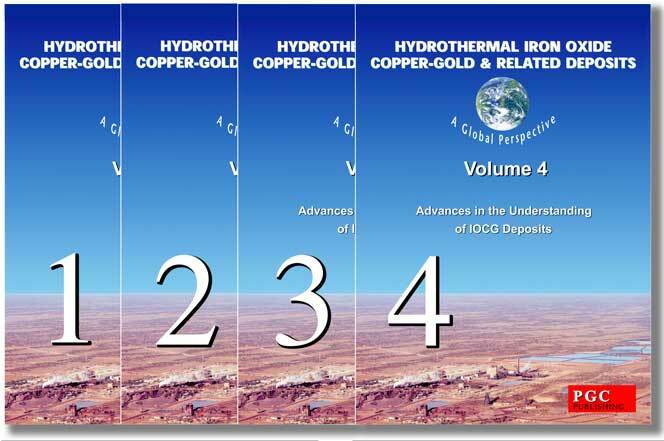 All three deposits lack associated late-stage hydrous epithermal events. • The second and third phases are composed of fine biotite monzonite (MBF1 and MBF2) which have a medium to coarse grain size and porphyritic texture. Phenocrysts are irregular quartz eyes and bimodal sized plagioclase crystals. MBF1 has biotite phenocrysts, while MBF2 only has small biotite crystals. 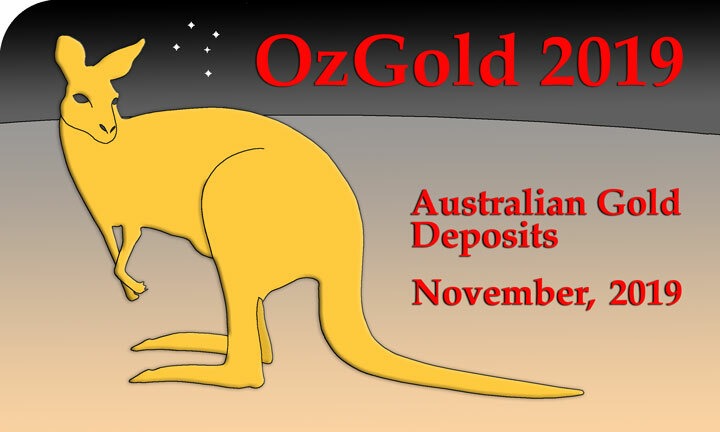 • The first of these represents the fourth phase in the deposit. It is a medium to fine grained mafic monzonite (MZM), with a high content of mafic minerals (hornblende>biotite), seriate textured plagioclase and scarce quartz eyes. It was predominantly intruded in the northern part of the deposit area and is apparently responsible for production of the garnet-pyroxene>magnetite skarn bodies in the Ferrobamba limestones. It has been subjected to potassic alteration producing secondary biotite, orthoclase and magnetite. • The fifth phase is a hornblende monzonite (MZH) composed of medium grained short tubular plagioclase and prismatic hornblende crystals. It occurs in the central portion of the deposit and includes multi-directional radiating dykes. It intrudes prograde skarn bodies with associate quartz veinlets containing chalcopyrite, bornite and molybdenite. According to Perelló et al. (2003), the mineralisation-related intrusive phases are dacitic in composition and intrude both unmineralised intrusions and skarn altered wall rocks of the lower Ferrobamba Formation with associated contact breccias. The porphyry style mineralisation is accompanied by early potassic alteration, with secondary biotite dated at 35.6±0.9 Ma (K-Ar; Perelló et al., 2003), accompanied by quartz veins and veinlets, overprinted by a sericite-clay-chlorite assemblage, with chalcopyrite and lesser bornite as the principal copper sulphides. A late barren phase occurs as NW-SE trending dykes which cut all of the above units. It is a medium grained porphyritic quartz monzonite (MZQ) with <15% quartz eyes and short tubular plagioclases. The Mineral Resource at Ferrobamba has a north-south elongated 1500 x 1100 m footprint within a pit that will be ~2500 x 1800 m, with ore persisting over a vertical interval of ~900 m (JORC Compliant Assessment and Reporting Criteria Tabulation, MMG, 2017). Both classic porphyry-style (stockwork, sheeted and dissemination) and skarn-hosted mineralisation occur within the deposit. The skarn-hosted mineralisation occurs as disseminated to clotty copper sulphides and superimposed porphyry-related sheeted veins and veinlets (Kelley et al., 2016). The majority of the skarn hosted ore blocks have grades of >1% Cu with zones of between 3 and 5% Cu, whilst the grade of the porphyry style mineralisation is ~0.5% Cu (Swendseid et al., 2014). Porphyry style alteration occurs as a weak potassic assemblage of secondary biotite and potassic feldspar replacing mafic minerals in the matrix, and veinlets with associated quartz. This alteration is not pervasive and primary lithologic textures are well preserved. The accompanying hypogene mineralisation occurs as fracture filled veinlets and as disseminated grains. The veinlets commonly form stockworks with quartz, chalcopyrite, bornite, chalcocite and molybdenite (Swendseid et al., 2014). The garnet and pyroxene skarn alteration is associated with the first three intrusive phases. The exoskarns generated by the first phase are found at the margin of the southern, central and eastern parts of the deposit. Skarns are composed of medium to coarse grained brown, reddish, green or yellow garnets with some pyroxenes and magnetite. The skarn bodies formed by the second phase are very similar, except that they do not contain quartz veinlets. Distal exoskarns are characterised by amphiboles, epidote, specularite and calcite. Marble is developed in limestone horizons peripheral to the exoskarns or in direct contact with some late dykes and intrusive bodies. The development and extent of the endoskarns is limited. They are composed of light brown garnets with scarce pyroxene, epidote, chlorite, calcic-plagioclases, or calcite with moderate silicification (Swendseid et al., 2014). According to Kelley et al. (2016), most of the skarn hosted disseminated to clotty mineralisation at Ferrobamba occurs in pockets (irregular masses) where the sulphides are interstitial to subhedral garnet crystals. These pockets developed through a variety of open-space and solid-state replacement processes within the skarn host. These pockets are the result of variable reactivity and increased permeability of the rock. Pocket-filling assemblages comprise calc-silicate (garnet, clinopyroxene), hydrous calc-silicate (epidote, amphibole), hydrothermal (quartz, carbonate, biotite, K feldspar, specular hematite) and sulphides (bornite, chalcopyrite, molybdenite). Many pockets show evidence of successive replacement and most sulphide mineralisation is parageneticaly late. Much of the high-grade mineralisation at Ferrobamba is hosted in garnet skarn that has been overprinted by clinopyroxene. Late-stage bornite replaces and upgrades earlier chalcopyrite mineralisation (Kelley et al., 2016). Kelley et al. (2016) suggest pocket may reflect and be the result of: i). remnants of carbonate protolith or early clinopyroxene skarn; ii). later, interstitial, fine-grained prograde garnet skarn or clinopyroxene skarn superimposed on garnet skarn; iii). later retrograde (hydrous) skarn replacement; iv). filling or replacement by hydrothermal quartz and carbonate; and v). volume creation by brecciation and fracturing. Brecciation may be related to volume reduction during skarn mineral replacement, explosive hydrothermal brecciation, or local structural adjustments. 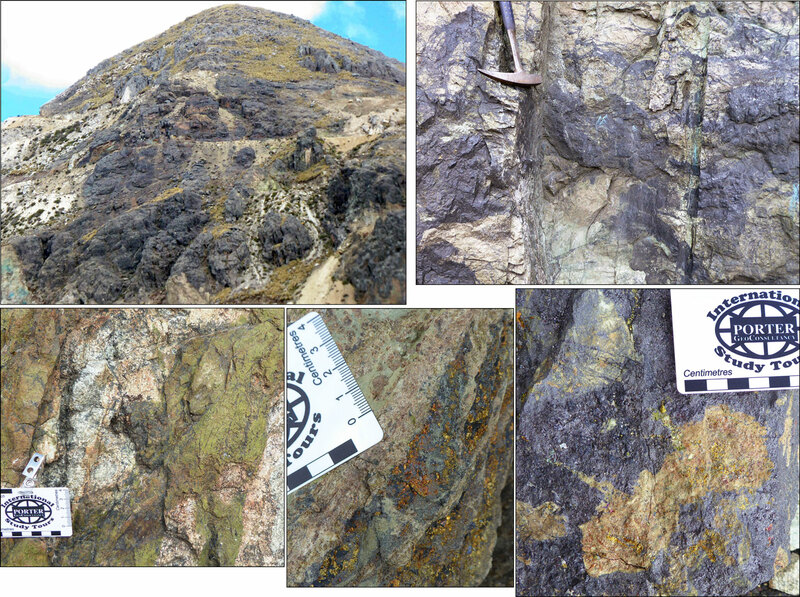 Some of the principal lithologies and mineralisation at Ferrobamba - Top left: Sheeted veining within low grade intramineral porphyry; Top right: mineralised vein within intramineral porphyry; Centre left: High grade garnet endoskarn; Centre right: high grade pyroxene (diopside - CaMgSi2O6) rich exoskarn after an impure carbonate protolith; Lower left: bornite-rich garnet exoskarn [grossularite Ca3Al2(SiO4)3 near intrusive contact, grading to distal andradite Ca3Fe2(SiO4)3]; Lower centre: banded garnet-diopside exoskarn, interpreted to be mimicking original bedding; and Lower right: less altered distal host rock composed of marble and weakly altered calc-silicates and transitional skarn, including fracture controlled garnet. Images by Mike Porter., 2018. Porphyry style mineralisation within the exoskarn includes quartz veins and veinlets containing variable quantities of bornite, chalcopyrite and chalcocite (Swendseid et al., 2014). The alteration associated with the late post-mineral intrusive phases dykes included chloritisation of mafic minerals, secondary biotite, chlorite in veinlets and some quartz veinlets with secondary biotite or chlorite halos (Swendseid et al., 2014). An upper oxide zone at Ferrobamba is typically ~20 m thick, although it can locally extend to greater depths in zones of more intense fracturing and faulting. The mineralogy is principally composed of chrysocolla and minor amounts of malachite, cuprite and native Cu (Swendseid et al., 2014). These observations would suggest largely barren, brittle, prograde skarn was formed by more than one phase of the intrusive complex, including the precursor, higher temperature mafic and intermediate diorite to granodiorite pulses. These skarn altered rocks then acted as a focus of mineralisation that accompanied late, evolved, and terminal stage porphyry intrusions, which during their emplacement, induced fracturing, brecciation and production of open space within these chemically receptive lithologies. The process of mineralisation then produced a mainly retrograde skarn assemblage, overprinting the more extensive earlier prograde skarn. This retrograde skarn assemblage accompanied disseminated to clotty ore and sheeted veins, surrounding the disseminated, veinlet and sheeted vein porphyry mineralisation within the late stage intrusions. The Chalcobamba deposit has a combined north-south elongated 1700 x 900 m footprint with ore persisting over a vertical interval of ~800 m, within a pit that will cover an area of 2500 x 1300 m (Swendseid et al., 2014; JORC Compliant Assessment and Reporting Criteria Tabulation, MMG, 2017). It is mostly developed on the nose and eastern limb of a north-plunging syncline defined by a U-shaped zone of skarn altered marbles and limestones of the lower Ferrobamba Limestone unit. It comprises i). a mineralised multiphase porphyry intruding an earlier barren porphyry; ii). an extensive zone of variously mineralised skarn alteration related to the earlier intrusion; and iii). Lower to Upper Cretaceous sedimentary sequences of the Mara and Ferrobamba formations. As at Ferrobamba, both porphyry and skarn hosted mineralisation is present. Grades within the intrusives rocks are generally low, ~0.3% Cu, although they can be as high as 0.5% Cu in the mafic monzonite. In contrast, continuous intervals of 2% Cu occur within the magnetite skarn. The average grade of the other skarns varies from 0.3 to 1% Cu, with zones as high as 2% Cu. • Diorite, which is the first intrusive event recognised in the area, emplaced as sills within the Ferrobamba formation. • Granodiorite, which is found to the east and south of the deposit, occurring as a coarse-grained stock that contains aggregates of biotite, but no observed associated mineralisation. Granodiorite cuts through some skarn bodies in the east and northeast of the deposit area. • Medium-grained porphyritic hornblende monzonite (MZH) with acicular hornblende phenocrysts, that was emplaced in the central section of the deposit and extends toward the southeast and south. This stock altered the carbonate country rocks to produce a medium to coarse-grained green to brown garnet exoskarn with minor pyroxenes. • Mafic monzonite (MZM) that crops out in the north and northeast part of the deposit area and is characterised by high contents (>30%) of mafic minerals. It is associated with a brown garnet copper-bearing exoskarn and a plagioclase-chlorite endoskarn with moderate amounts of disseminated chalcopyrite. • Biotite monzonite (MZB), which has a medium porphyritic texture with small biotite books and short prismatic hornblendes. It was emplaced as dykes and small bodies, principally in the more mineralised central zone and extends to the west. • Quartz monzonite (MZQ), which is the final phase, and has a medium to coarse grained porphyritic texture with quartz eyes and potassic feldspar crystals. It occurs as NW-SE and east-west trending dykes in the southern and northern parts of the Chalcobamba deposit area, where it truncates all of the above units and is largely barren. Polymict, tectonic matrix-supported breccias occur as irregular and elongated bodies with a general NW-SE elongation. The clasts are sub-rounded and composed of mafic monzonite, skarn, marble and biotite monzonite. The groundmass is rock flour, primarily composed of clays, chlorite and calcite. They are cut by the late quartz monzonite dykes. Mineralisation within these breccia occurs in both the clasts and groundmass as disseminated grains of copper sulphides with lesser quantities of oxides (Swendseid et al., 2014). To the immediate NW of the deposit, a large mass of quartz feldspar porphyry intrudes the biotite monzonite (MZB) and garnet skarn, but is intruded by quartz monzonite (MZQ) dykes that follow a sharp NE-SW line that limits the porphyry to the SE, possibly a faulted contact. Alteration products vary across the deposit, controlled by proximity to fluid source, permeability and lithology, varying from potassic assemblages in the intrusive hosts, with equivalent skarn and marble within proximal and distal carbonate host rocks respectively. Within the intrusives, the potassic alteration assemblage comprises quartz, secondary biotite and orthoclase in the groundmass with variable associated chalcopyrite as disseminated grains and in quartz veinlets and stockworks. Secondary biotite from samples of this alteration suite has been dated at 35.6±0.9 Ma (K-Ar; Perelló et al., 2003) overprinted by sericite-clay-chlorite. 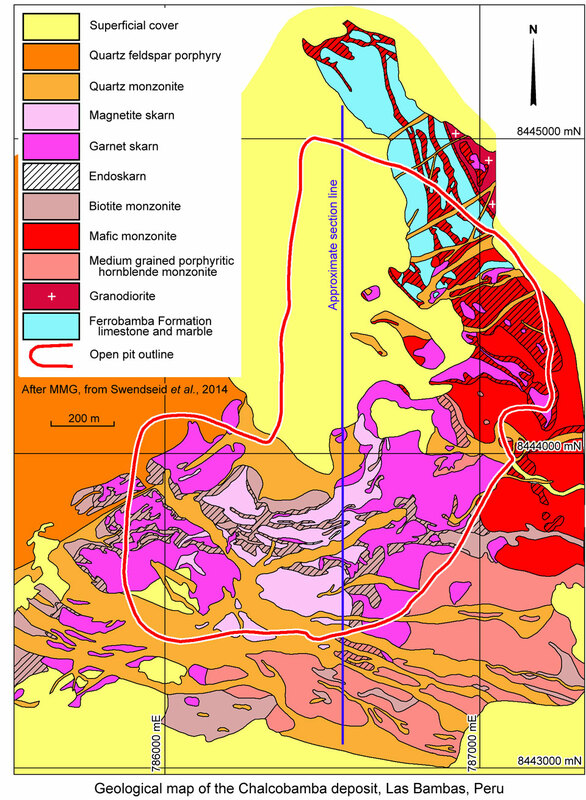 Skarn alteration commenced during the emplacement of the mafic monzonite phase to produce both magnetite and garnet pre-mineral skarns within the Ferrobamba Formation. The succeeding biotite monzonite cuts the pre-existing magnetite skarn bodies and forms an exoskarn characterised by light-brown garnets, and an endoskarn of garnets, epidote, amphibole, specularite and albite. Chalcopyrite is associated with molybdenite within the endoskarn. It is considered likely that this phase was responsible for the mineralisation that overprinted the pre-existing magnetite and garnet skarns. 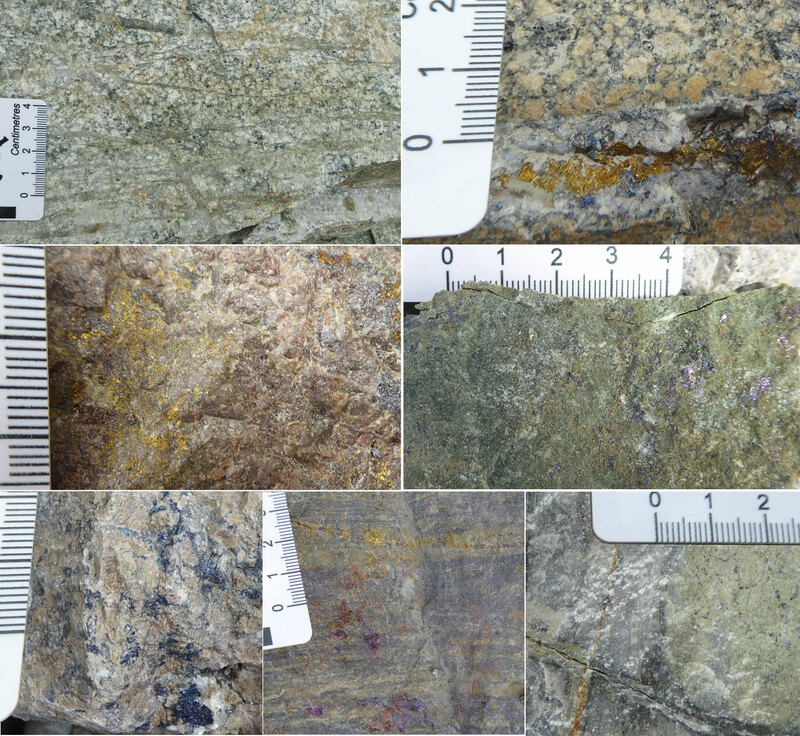 Retrograde exoskarns and endoskarns developed during this phase contain assemblages that include epidote, amphibole, specularite, chlorite and calcite with variable chalcopyrite. Some of the principal lithologies and mineralisation at Chalcobamba - Top left: Characteristic exposures of magnetite-rich skarn (dark rocks) on the hill at Chalcobamba; Lower left: magnetite-garnet-epidote endoskarn; Lower centre: mineralised magnetite-garnet-epidote endoskarn; Top right: Magnetite replacing prograde garnet exoskarn; and Lower right: sulphides replacing both prograde garnet and the overprinting retrograde magnetite in the exoskarn. In the same area, late garnet can also be seen overprinting prograde garnet, retrograde magnetite and sulphides. Images by Mike Porter., 2018. The main hypogene copper mineralisation is associated with the magnetite and magnetite-garnet skarns, principally occurring as chalcopyrite with trace bornite. The highest copper grades occur in the magnetite skarn where the chalcopyrite occurs as irregular masses, patches, irregular veinlets and disseminated grains. Disseminated grains of chalcopyrite and lesser proportions of bornite are observed associated with altered secondary biotite (Swendseid et al., 2014). Shallow levels within the mafic monzonite phase in the north of the deposit, have been locally enriched with cuprite and native copper, with traces of secondary chalcocite and iron oxides, although no well developed zone of secondary enrichment was developed or preserved (Swendseid et al., 2014). According to Kelley et al. (2016), unlike at Ferrobamba, Chalcobamba is dominated by chalcopyrite hosted in garnet and magnetite skarn. Skarn is characterised by early dark green, coarse-grained garnet that was brecciated and cemented by fine-grained pale reddish garnet, followed by magnetite replacing garnet. This retrograde skarn development appears to be genetically associated with the Vizcacha monzodiorite porphyry stock at the centre of the deposit. A major north-south elongated breccia pipe formed after skarn development to the NNE of this stock. This breccia mass comprises ~30% of the deposit, which reworked early skarn into the breccia before being cross cut by late quartz monzonite dykes of the Chuspiri swarm. • Diorite, the earliest intrusive phase in the deposit area, occurring as up to 50 m thick sills that dip to the south. It has a high magnetic susceptibility and a medium-grained equigranular texture with a predominance of anhedral hornblende and plagioclases. This phase is interpreted to have been related to the formation of brown to yellow garnet skarn bodies with minor magnetite which are partly conformable with the Ferrobamba Formation limestone horizons. • At least three similar phases of quartz feldspar porphyry, distinguished differently sized K feldspar phenocrysts and quartz eyes. The first of these porphyries has been subjected to extensive potassic alteration in the central portion of the deposit, with secondary biotite, K feldspar, and quartz. Towards the periphery K feldspar has declined substantially and is associated with epidote, chlorite and pyrite. The latter outcrop in the northern portion of the deposit area where they are concealed in part by thin remains of garnet skarn and moraines. • Latite, which is one of the last intrusive phases and is considered to be post-mineral. It occurs as NE-SW trending dykes which are characteristically medium-grained with weak alteration of mafic minerals to chlorite and associated disseminated pyrite. A 200 m diameter magmatic breccia is exposed in the NE of the deposit area. It comprises a greenish-grey groundmass containing fine amphiboles, enclosing clasts of skarn, diorite, quartz feldspar porphyry and sulphides. In addition to mineralised clasts, the matrix is cut by veinlets of quartz with sulphides (pyrite>>chalcopyrite) and contains disseminated pyrite with lesser chalcopyrite mineralisation (Swendseid et al., 2014). Hypogene mineralisation occurs in both skarn altered masses and the diorite/monzodiorite intrusive phases. The dominant copper sulphide is chalcopyrite, which occurs as irregular masses, patches, disseminated grains and in veinlets in mgnetite-, garnet- and pyroxene-skarn bodies. Within the intrusives, chalcopyrite, pyrite and molybdenite are present as disseminated grains in fractures and in quartz veinlets. Molybdenite occurs in quartz veinlets. Copper grades in the bulk of the intrusive phases are <0.5% Cu, even when associated with intense potassic alteration. Grades of >0.5% Cu occur in proximity to the skarn bodies. Throughout the entire system, the pyrite content is generally >1%, mostly as small cubic crystals and aggregates (Swendseid et al., 2014). According to Kelley et al. (2016), copper mineralisation has been dated at 34.09 to 34.58 Ma (Re-Os molybdenite) and occurs within a NE-SW trending, 100 to 200 m wide elongate garnet and magnetite skarn fringing the contact with the older ~36.11 Ma Chonta monzodiorite. The ratio of chalcopyrite to pyrite is nearly equal, with the best copper grades generally found where pyrite is also present. Immediately to the north, 32.99 Ma (Re-Os) porphyry style mineralisation followed skarn formation. To the south, within distal skarns and marbles, sphalerite and galena are locally associated with chalcopyrite and pyrite. Several breccia bodies have been identified associated with the mineralisation, including syn-mineral hydrothermal breccias and a late intrusive breccia pipe. NE-striking post-mineral monzogranite dykes cross cut all of the units. Magmatic biotite associated with early mineralisation yielded an age of 35.2±0.9 Ma (K-Ar; Perelló et al., 2003). 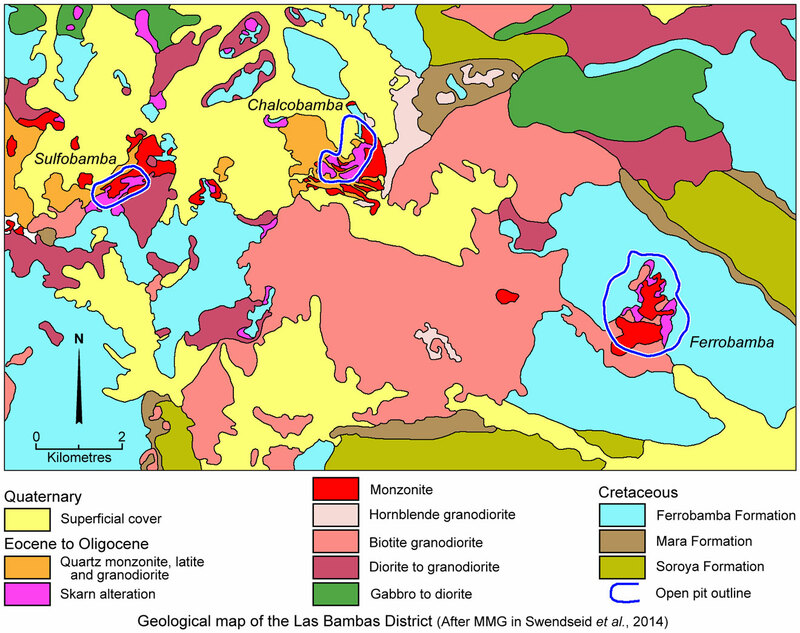 The principal alteration type in all of the Las Bambas deposit cluster is potassic, directly associated with mineralisation, occurring early in the evolution of each porphyry system, and consists of quartz, biotite and K feldspar. Hydrothermal biotite replaces ferromagnesian components, typically magmatic hornblende and, less commonly, magmatic biotite. It also occurs in the groundmass of porphyry stocks and in veinlets, either alone or accompanied by other silicate phases. 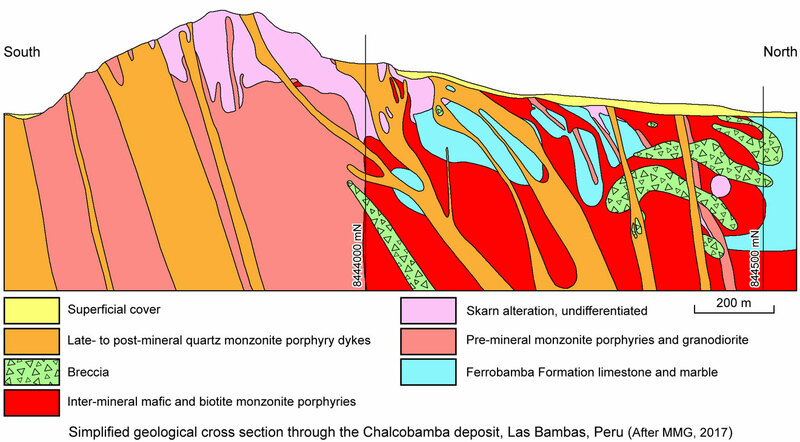 Major quantities of quartz were introduced as either uni- or multidirectional veinlets during potassic alteration, comprising A-type veinlets which carry significant mineralisation in the form of chalcopyrite and/or bornite at Ferrobamba and Chalcobamba in particuar, while Chalcobamba also has B-type veinlets, characterised by semicontinous centrelines filled by mm- to cm-sized grains of bornite and chalcopyrite (Perelló et al., 2003). The Las Bambas deposits have also been subjected to significant sericite-clay-chlorite alteration. This assemblage imparts a pale-green overprint to potassic alteration and gives a soft aspect to the rock (cf. Sillitoe and Gappe, 1984). It generally modifies, but preserves some of the original rock textures. It varies in both intensity and mineralogy, although assemblages always include one or more association of sericite (fine-grained muscovite), illite, smectite, chlorite, calcite, quartz and varied proportions of epidote, halloysite and albite. Plagioclase (both phenocrysts and groundmass) is replaced by a pale-green, greasy sericite assemblage which also includes illite and locally smectite. Amphibole and biotite, the latter of magmatic and/or hydrothermal origin, are characteristically replaced by chlorite. Calcite is common as a replacement of plagioclase, (Perelló et al., 2003). Propylitic alteration (chlorite, epidote and calcite) is mainly found as part of the outer halo confined to noncarbonate wall rocks, and at the Las Bambas deposits occurs within porphyry copper ore zones in late-mineral stocks and dykes. In both cases, ~1% disseminated and veinlet pyrite is common. Calc-silicate alteration is an important associate of mineralization at the Las Bambas skarn-porphyry cluster. Garnet, diopside, epidote and actinolite are the characteristic alteration assemblages (Terrones, 1958; Santa Cruz et al., 1979). The bulk of the Cu(-Au, -Mo) mineralisation at Las Bambas was introduced during prograde events, typically as chalcopyrite and, less commonly, bornite. The distal skarn mineralisation is richer in Pb and Zn, and also contains structurally and lithologically controlled, yellow-brown jasperoid developed in limestone beyond the skarn front (Zweng et al., 1997). The bulk of the Las Bambas cluster mineralisation formed during a brief temporal interval of ~0.5 m.y., in the latter part of the evolution of the Andahuaylas-Yauri batholith that had been intruded over a 10 m.y. period (Kelley et al., 2016). The depth of partial to complete oxidation of sulphides is generally 30 to 50 m but, varies considerably due to the steep topography. Economically significant zones of supergene enrichment are absent, largely because of the high degree of neutralisation of both potassic alteration zones and particularly the carbonate country rocks. Consequently, most cappings are immature, and typically goethitic, with the development of malachite, chrysocolla, neotocite, pitch limonite, and associated copper oxide minerals. The porphyry-related skarn mineralisation, at Las Bambas was oxidised to form gossan zones as oxidation products of magnetite and massive sulphides (Perelló et al., 2003). Recent glaciation has removed any secondary enrichment, if it existed, from all three deposits and only thin zones of oxidation are preserved. Skarn mineralisation - 239 Mt @ 1.36% Cu, 0.0220% Mo, 0.14 g/t Au. Total Inferred resource - 500 Mt @ 0.50% Cu, 0.0149% Mo, 2.4 g/t Ag, 0.03 g/t Au. Sub-total resource - 9.9 Mt @ 2.0% Cu. Ferrobamba TOTAL resource - 1.361 Gt @ 0.63% Cu; includes Proved + Probable reserves of 823 Mt @ 0.69% Cu. Sub-total resource - 6.8 Mt @ 1.5% Cu. Chalcobamba TOTAL resource - 0.322 Gt @ 0.59% Cu; includes Proved + Probable reserves of 202 Mt @ 0.66% Cu. Sulfobamba TOTAL resource - 0.184 Gt @ 0.62% Cu; includes Proved + Probable reserves of 60 Mt @ 0.80% Cu. Las Bambas TOTAL resource - 1.873 Gt @ 0.62% Cu; includes Proved + Probable reserves of 1.085 Gt @ 0.69% Cu. The outlines of the three deposits above merged, and interpreted from diagrams contained in an X-Strata presentation by P Forrestal (2005), and from Perelló et al. (2003); Kelley et al. (2016) and Swendseid, T., Addison, R., Acuna, E. and Sousa, R., 2014 - Las Bambas Project, Peru Competent Person Report, prepared for MMG Limited by RungePincockMinarco, 77p. Kelley, D., Wise, J. and Shannon, J., 2016 - The Las Bambas porphyry cluster in the Andahuaylas-Yauri Batholith, southern Peru: in Denver Region Exploration Geologists Society, Technical Presentation, October 3, 2016, Abstract. Abstracts 2p. Perello, J., Carlotto, V., Zarate, A., Ramos, P., Posso, H., Neyra, C., Caballero, A., Fuster, N. and Muhr, R., 2003 - Porphyry-Style Alteration and Mineralization of the Middle Eocene to Early Oligocene Andahuaylas-Yauri Belt, Cuzco Region, Peru: in Econ. Geol. v.98., pp. 1575-1605. Swendseid, T., Addison, R., Acuna, E. and Sousa, R., 2014 - Las Bambas Project, Peru, Competent Person Report; selected extracts: in Competent Person Report, prepared for MMG Limited by RungePincockMinarco, submitted to the Stock Exchange of Hong Kong, pp. IV-2, IV 5-7, IV 33-45, IV 57-59.